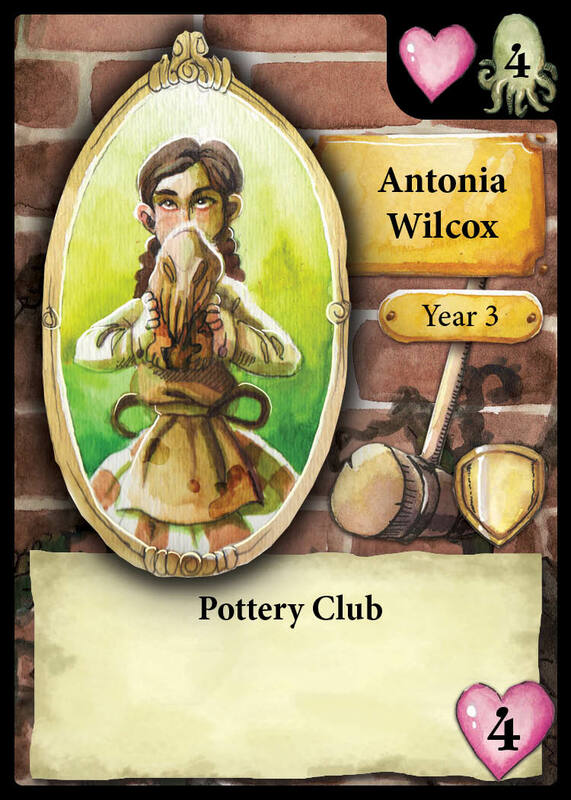 The Miskatonic School for Girls is the first deck building game where you get to build your opponent's deck! Plus, it has Cthulhu! 1,102 backers pledged $63,763 to help bring this project to life. Thanks for taking the time to check out our deck building Kickstarter project! Here’s the lengthy text for those of you who want to get even more Cthulhu goodness than you get from watching the video! 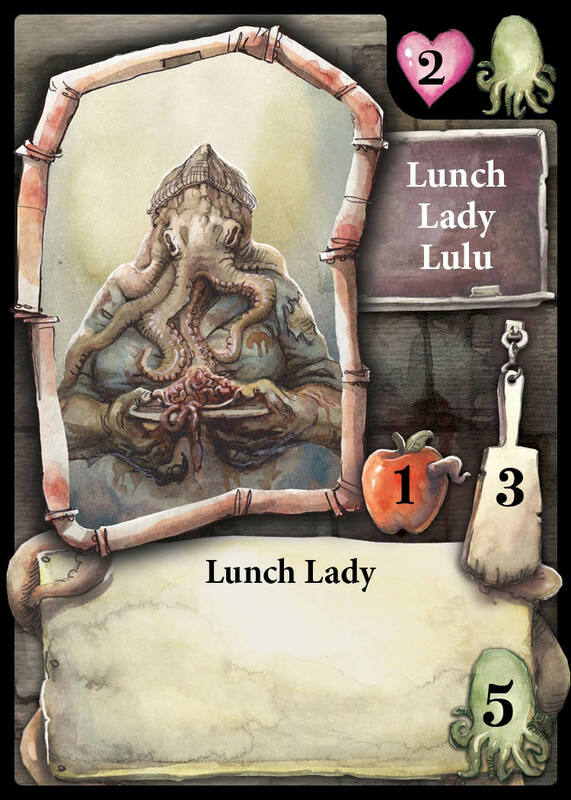 The Miskatonic School for Girls is the first deck building game where you get to build your opponents deck. This unique feature creates a totally different play dynamic from other deck building games. If you haven’t already guessed, Miskatonic School for Girl’s setting and themes are rooted in the Cthulhu Mythos. While H.P. Lovecraft may have written his stories with a far more sinister tone, our game is lighthearted and cheery, because we’re twisted like that. Play as a house of students at Miskatonic as they try to survive with their sanity intact. This is going to be a challenge as the entire faculty consists of mind-rending creatures and insane cultists! Gather friends to help stave off these wretches, and while you’re at it, why not send a few of those wretches to the other houses... Hey, nobody likes a tattletale, but when you’re sanity is on the line, you’d start snitching, too! If you can manage to be the last house with any amount of sanity left, you win! 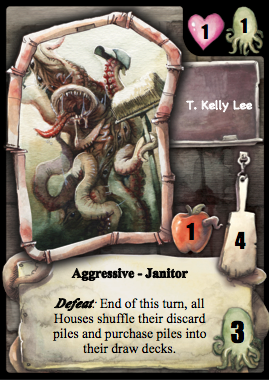 MSFG has players assuming the roles of rival houses at Miskatonic. Each house has a healthy level of sanity (20) at the beginning of the game. As the game goes on, that precious sanity will slowly be torn away by the faculty of the school. In order to combat the bad teaching methods of the Great Old Ones, the students of the house need to band together! During your turn, you’ll buy your new friends with friendship points and use nightmare points to send faculty after the rival houses. Eventually, those Faculty will end up in a players hand, where they will hold class, teaching your innocent students about the horrors around them. This has a detrimental effect on your house’s sanity. Due to the overwhelming power of the dark truth, it’s just a matter of time before your house goes completely bonkers. The last house left with any sanity is the winner! The Miskatonic School for Girls was designed by Geek Dynasty and produced by Fun to Eleven. The project is led by award winning game designer Luke Peterschmidt. Luke has been working as a professional game designer for the past 16 years, on projects ranging from the Guardians CCG, to the Legend of the Five Rings CCG, to Bakugan (yes, that Bakugan). This project marks his return to his geek roots. With all his projects, Luke strives to bring the players the best gaming experience possible. After many hours of a work and sacrificing interns to the printer gods, we feel that we have a game that truly delivers on that promise. Speaking of interns, we’d also like to thank Antonio Coach, Tim Davis, and Abby Tomlinson for putting up with our insanity, as well as congratulate them on surviving! Lastly, Rob Noss deserves a lot of credit here for making coffee, editing videos, and instilling a sense of fear in the office every day. A good working environment for a project like this. The art of Miskatonic was brought to life by Betsy Peterschmidt. Betsy is a student at the Pratt Institute where she studies the fine (and dark) arts. Having drawn all her life, Betsy has honed her style and created a fun, unique look, that certainly sets it apart from any Lovecraft themed art that has ever been done before! The graphic artist who put the project together is Jay Hernishin. Jay's a life long gamer and has been a graphic designer for some 20 years or so. His skills are on full display on this product. In the Cthulhu mythos, knowledge of reality and its cosmic horrors is usually enough to destroy a human’s mind. So rather than putting our minds at risk, we worked with Kenneth Hite on this project. Ken is a foremost expert on Lovecraft’s work, and a fairly snappy dresser as well. You might know Ken from several of his books and articles detailing Lovecraft and the Cthulhu Mythos, including Cthulhu 101, Where the Deep Ones Are, and Tour de Lovecraft: The Tales, along with his regular column in Weird Tales magazine. Ken has also worked on a multitude of roleplaying games such as GURPS Horror, The Day After Ragnarok, and his own Cthulhu-based role-playing game, Trail of Cthulhu. No doubt, Ken has his tentacles in all things Cthulhu (ew)! Right now the game design is complete, the art is done, and all that’s left is for us to raise the money needed to make the game a reality. We’re going to posting a bunch of art and updates from the game over the next few days, as well as an interview with Betsy and a full copy of the rules. If you have any questions at all about the game, the staff or if you just want to know where Ken has his tentacles currently, don’t hesitate to send us your question. We’ll be sure to get back to you once our nightmares stop. Limited Edition Betsy Peterschmidt Print. This painting was specially commissioned as a gift by Jay, who is awesome, for Luke, who is thankful, and done by Betsy, who is more talented then both of those guys. There are 50 numbered 11"x14" prints of the piece, with #1 and #2 beings spoken for already. This includes shipping to the anywhere in the US. Not currently available outside the US as we have no idea what that would cost. Silly non-standard shipping tubes... Some prints are in the "Ulrich Offer as well"
This level gets you a complete MSfG game, complete with box, cards, custom insert, 4 game boards, and our eternal good will. Game + Super-Bonus-Exclusive-Ultra-Rare and generally fun-to-play promo cards! This is a complete copy of the game, plus 5 exclusive cards only available to Kickstarter supporters. You will get three copies of Seth Thuggua, the schools highly proficient tech support guy, along with two unique events – One that covers what happens when a rather famous visiting professor stops by (cough...Hastur...cough) and one that is all about the kids having a Bake Sale! Get the Game, INTERNATIONAL (a copy of the game with international shipping)! The Game and Super-Bonus-Exclusive-Ultra-Rare Promos, INTERNATIONAL (a copy of the game and a set of promos with international shipping)! The Ulrich Deal - Promo game and print. Got a request from a backer to make this one, and we aim to please! This contains a copy of the art print as well as a copy of the game + Promos. US Domestic Only. Even dropped the price by 3$ cause no one was looking. Double Barrel Insanity with promos! One game isn’t enough? Of course not! Save $10 and get two copies of the game and two sets of promo cards, giving you one copy to play and one to put in a time capsule for alien invaders to be confused by when they open it up in 900 years. Cause that’s how you roll. Or you could give the other copy to a friend, you make the call. Double Barrel Insanity, INTERNATIONAL (2 copies of the game, 2 sets of promos with international shipping)! 2 copies of the game, plus promos, plus print. Another request from a backer. Nikupink's Offer. 4 games, 4 sets of promos, INTERNATIONAL shipping. Cause someone on Kickstarter named Nikupink asked for it. And I'm slightly afraid of him/her/them. Everything from the Double Barrel Insanity with Promos option, plus you will receive an original framed Betsy masterwork from the game to be treasured for generations! Contact us for a list of available pieces. Free international shipping. See how the fast paced, insane world of a small game company works. Spend 2 weeks working out of the Geek Dynasty offices in glorious Lebanon Pennsylvania! You’ll get to work with us on whatever our current projects are. It could be another Kickstarter game, or maybe a major release based on a TV show, who knows? In addition, you’ll not get paid and have to find a place to live! You’ll also get 3 copies of the game, triple promo cards, and a line on your resume that will forever confuse future employers. Free international shipping. Custom Card + Painting Option. In addition to a copy of the game + promo cards, you get the amazing opportunity to work with our artist Betsy. 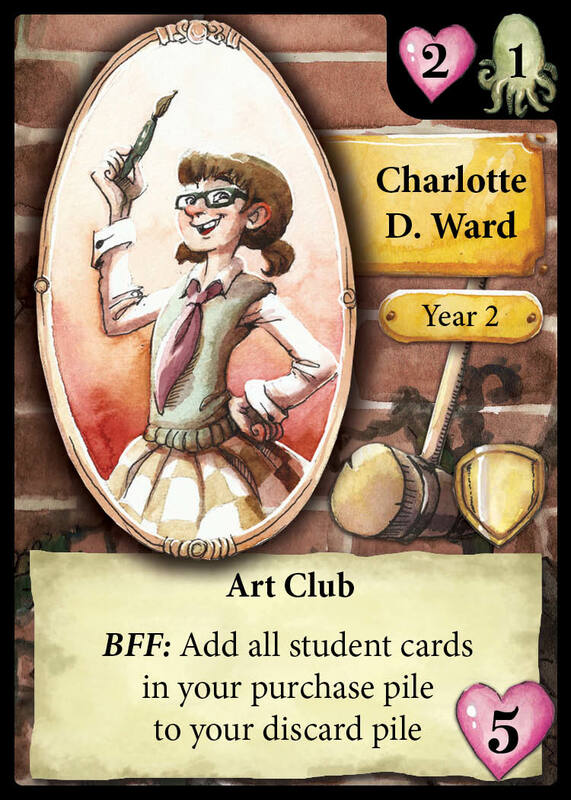 Armed with reference of your child, she’ll paint an image of your kid as a student at the Miskatonic School for Girls. Together you figure out which card she will replace in the set and Betsy will do a painting of your child. You will get 18 copies of the card featuring your kids image! (enough for 6 games, so you might want to buy 5 more…) You’ll also get the original artwork to adore and keep forever! We can also work with adults for a Faculty card if you want to have your own evil cultist mug on a card. Free international shipping. Same as the Custom Card + Painting option, but you’ll also get to work with our game designer who will design a new card for the set based on your child’s interest. In addition to receiving your 18 extra copies of the card, your card will be added to the BASE SET that every supporter receives! Truly a 1-of-a-kind way to show your love for your kid. And you do love your kid right? Free international shipping.